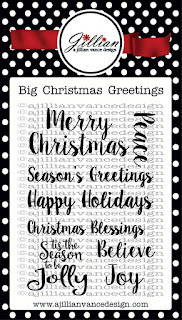 A Jillian Vance Design: tis the season..
Hey A Jillian Vance Design fans!! 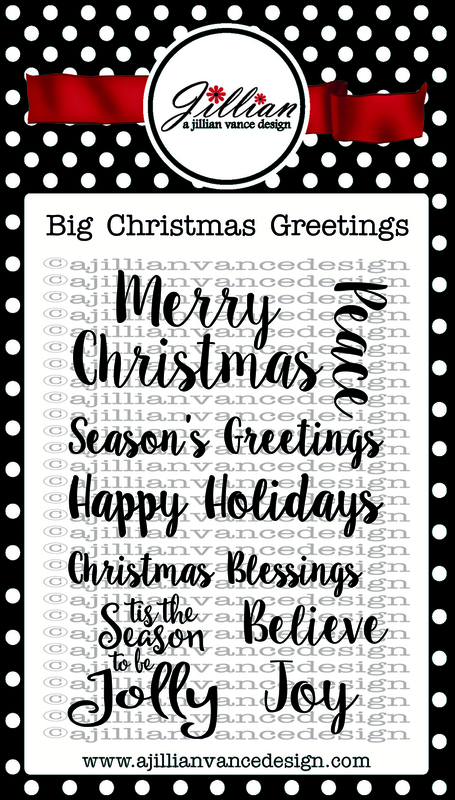 Its Rosemary here for my second post this week and this time I'm sharing a Christmas card I made using the Big Christmas Greetings stamp set and the Jingle Bells and Holly & Swirls dies. 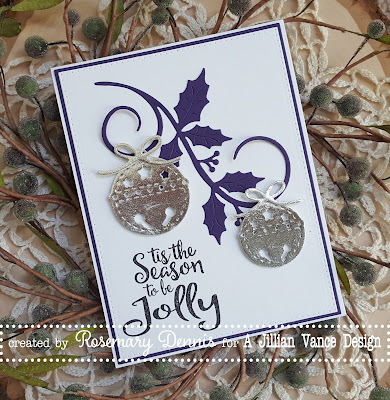 My inspiration for this card is this week's Merry Monday challenge to use purple, silver and white so I will be posting this to their gallery. As I was tiding up my little work space and trying to figure out what I would make I came across a silver jingle bell that I had made for another project. The bell was created by die cutting some self-adhesive fun foam, peeling the backing off the sticky side and then applying deco foil. Originally I was only going to use the one bell, but decided that two would look better with the holly swirl. 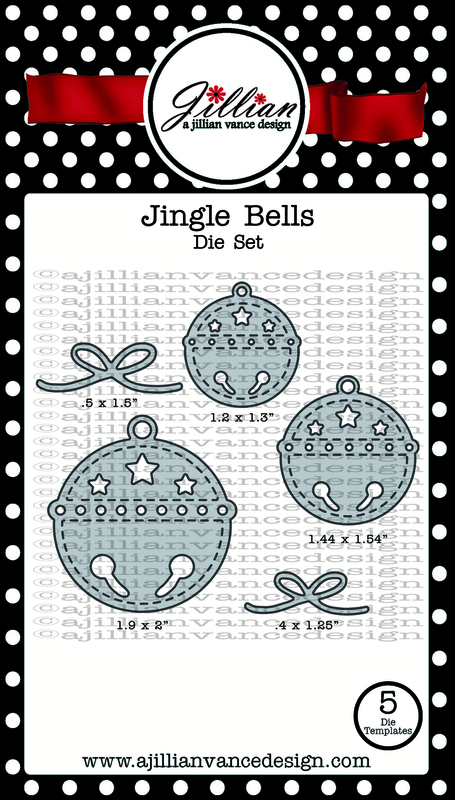 The little bows come from the Jingle Bell die set and those were also cut from self-adhesive fun foam and foiled. 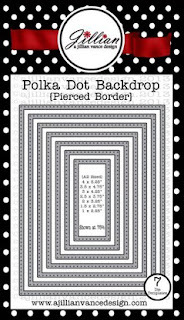 The holly swirl was die cut from purple cardstock. To be honest I wasn't sure everything would work, but I do think the card turned out quite nice! The white panel was die cut using a Polka Dot Rectangle backdrop die and the purple panel was cut using the largest rectangle backdrop die. After stamping the sentiment I layered all the elements and adhered to my card base. What a beautiful card! This might be our Christmas cards next year! We send out 160, and are always looking for pretty ideas. Thanks for sharing! What a pretty design, Jillian! I love your silver jingle bells! Thanks for sharing how you did them! A very pretty swirly holly branch too! Thanks for sharing with us at Merry Monday! I love your color combination with those wonderful dies! This is such a pretty and elegant Christmas card! 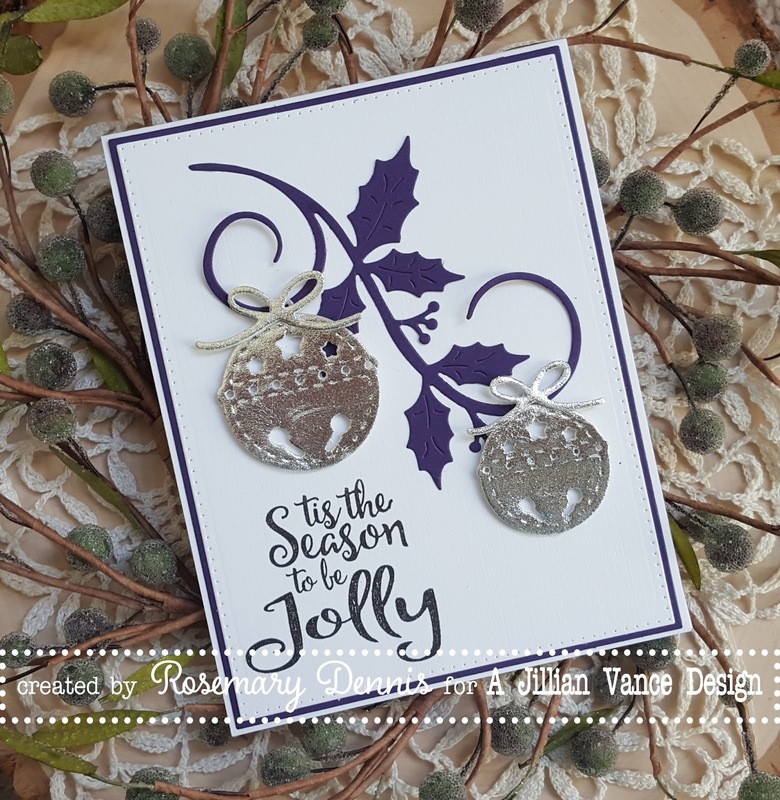 love those silver jingle bells with the purple swirls - wonderful card, Rosemary! 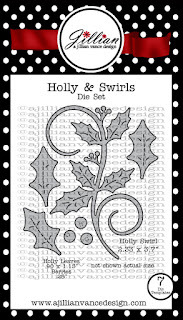 Love the bells with the fancy holly swirl! This is so pretty Rosemary!! LOVE this card, Rosemary! Now I have to save up for those bells as I need them for foiling! Never would have thought of bells on holly--looks wonderful! Beautiful card!I love the Holly & Swirls. Looking at the Holly leaves They could be used for many things. Such a fabulous design. I love the bells and the holly scroll. Gorgeous. I'd say this is a winner. 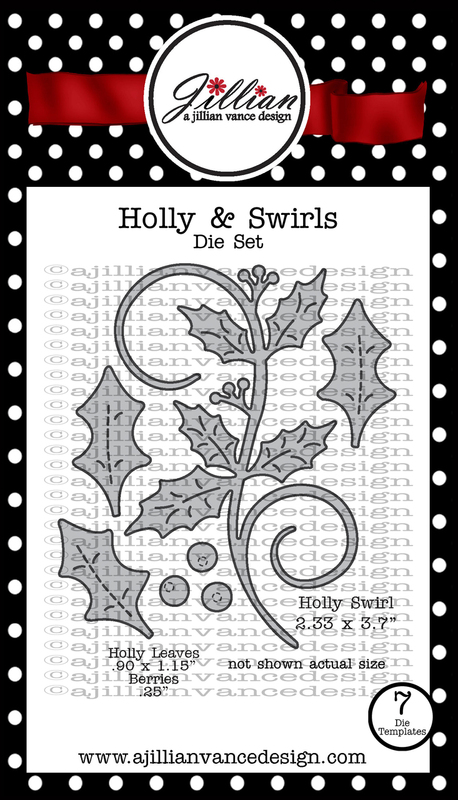 Lovely layout on your card with the swirled holly and those gorgeous bells.Beautiful. What a striking card this is, Rosemary. I love the Navy & Silver combination. These bells are my favorite and the holly is so graceful. Just love the silver bells with the purple holly, Rosemary!! Those look like great dies - thanks for sharing the pictures!! Such a beautiful Christmas card, Rosemary! I love the Holly and Swirls with your silver jingle bells, and your sentiment is perfect! Love this card!